Flexible solutions for filling of edible oil in various containers. The variegated packages in the edible oil bottling sector entail particular flexibility of the filling equipment as regards to format parts. An illustrative example of such solution can be seen in the last complete automatic IND-Oil bottling line installed in KadOil, Turkey. INDEX-6® put into exploitation a synchronous neck-handling Pragmatic® weight filling bloc which provides a capacity of 7000 bph. Filling is performed in a total of 8 different PET bottles 0.7L to 2.0L with facilitated re-adjustment for the different bottle sizes. 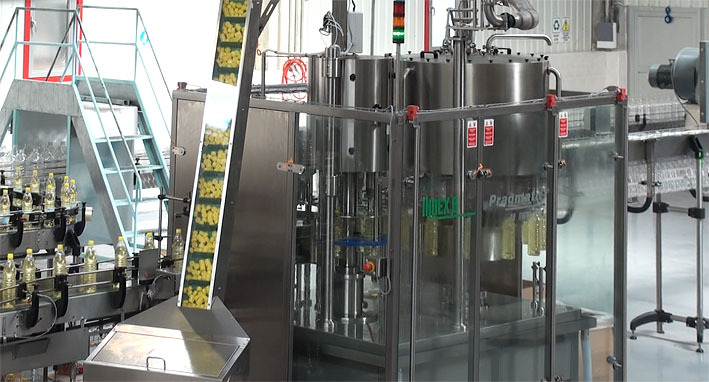 The line is equipped with IND-Trans and neck-handling IND-Trans Aero conveyor systems for transportation of the bottles from the unscrambler through the multibloc and the IND-Lab 36 labeling machine for application of one wrap-around hot-melt label, to the cartoning system IND-Pack 24. The buffer system with precise speed regulation ensures the smooth and continuous line operation with minimized downtime. The ready-packed boxes are fed to the palletizer by IND-Trans conveyors as well. The line is equipped with automatic control system, which requires a single operator for its complete maintenance.